In 1904, President Theodore Roosevelt was a man on a mission. 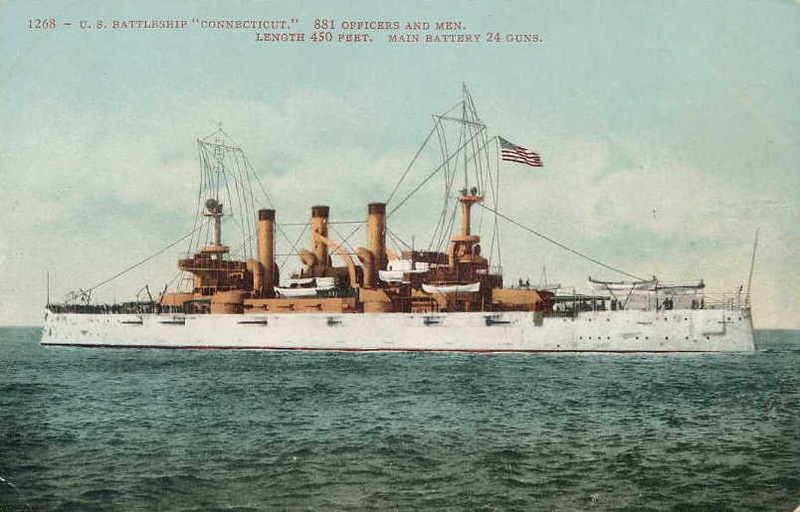 Intent on improving America's image world-wide, Roosevelt was preparing the United States Navy battle fleet for an ambitious journey around the globe that began in 1907. Nicknamed the Great White Fleet, 16 U.S. battleships made friendly goodwill visits to numerous nations around the world, while simultaneously showcasing the naval power and might of America. President Roosevelt, well-schooled in the gorgeous high-relief designs on ancient Greek coins, decided that America needed better coins to represent the country on the world-wide naval tour. Roosevelt aimed to upgrade the coinage that would be utilized on the sea journey. Roosevelt: U.S. coins are "hideous"
As luck would have it there were five coin series that the President was authorized to change without Congressional approval. One of them was the $20 Gold Double Eagle, a coin actively used in international trade, which made it a perfect choice for the redesign. The Liberty Head double eagle was struck as a pattern coin in 1849 and then for commerce from 1850 through 1907, designed by the Chief Engraver at the Mint for the United States James B. Longacre. Augustus Saint-Gaudens, one of America's greatest sculptors, was a personal friend of President Roosevelt and was receptive to the idea to redesign America's coins. The two decided the new Double Eagle would feature a beautiful high-relief design with a high rim to protect the features. The creation of this stunning coin that investors treasure today was not without controversy. The U.S. Mint Engraver Charles E. Barber fought back with concerns the Mint could not create the high-relief design in the quantities needed. While a coin design typically only took one year, this masterpiece took three to create. Sadly, Saint-Gaudens passed away in 1907, after the designs were finalized for production, but before a coin was struck. After the coins were finally struck, further controversy hit as the design lacked the words: "In God We Trust." Congress stepped in and required those words be added to the legendary coin. The Saint-Gaudens Double Eagle coin was minted and used primarily in international trade until 1933. The Double Eagle is just one example of pre-1933 gold coins, but is considered to be one of the most valuable coins of all time. The U.S. government halted minting gold coins as a currency in 1933 and recalled coins from circulation. Many of those beautiful coins were melted down into bars that are stored in Fort Knox today. Every pre-1933 gold coin that you've ever seen managed to escape the gold coin recall in 1933. Because of the low survival rates, pre-1933 gold and silver coins are the most desirable area of the rare coin market. The most successful gold investors assemble a diversified and balanced portfolio, including multiple investments including gold bullion and rare numismatics. The combination of history, low mintages/survival rates and price appreciation increase the long-term profit potential for pre-1933 gold coins. The fact that many coins of those term were melted set this area of the market up for outsized gains during times of gold price appreciation. The $20 Saint Gaudens Liberty Double Eagles are rare in that they mimic the movements of gold bullion. When gold is up, so are $20 Liberty Eagles. Once gold starts a significant run, these coins tend to simultaneously outperform gold prices. Not all pre-1933 gold coins are of the same quality. As with all coins, there are significant variations in strike, luster, number and severity of contact marks, and other factors which need to be considered. Go for the best quality and best dates you can afford. Consult with a numismatic expert at Blanchard today if you are unsure about the best opportunities to meet your financial goals. Our meticulous coin acquisition is unrivaled, and it reflects the union of our superior business principles and impeccable rare coin selection methods. Call Blanchard today at 1-800-880-4653. Just another “Gold Bug”..which I had more.